When I was asked last year to review a Citrix XenServer administration book by Packt Publishing I immediately accepted the offer with great enthusiasm. Not only because I was asked for my knowledge on the subject, but also because it meant a publishing company was making an effort to produce a line of books on Citrix products and offering a way for new administrators to get insights into the products and practical instructions on the best implementation from experts that wanted to share their knowledge and experiences. After all, how many books are out their to support administrators for Citrix XenApp, Citrix XenDesktop and even Citrix XenServer? Other than the provided books from the official training courses? It was my pleasure to provide the author with my feedback and technical insights to improve the technical quality and consistency of the book and share my knowledge and experience. It also made me realize Packt Publishing was very serious on providing technical books on a great variety of current day solutions. And were eager to publish even more Citrix books. As I take each and every job or assignment very seriously I also take working for Packt Publishing as a book reviewer very seriously, which means I needed a lot of spare hours to read each chapter, write many lines of feedback and share my own knowledge on the subject. And as I keep a very high standard on how to professionally do my job, that spare time isn’t always available. so I even had to stop my review work on another book as I could not find enough spare time to spent on that book. Fortunately for me, I did get a new request from Packt Publishing, this time to write a book review on my blog and share my thoughts on a new release, the Citrix XenDesktop 5 Starter book from their Instant series. A series that offers readers a way to “Learn something new in an Instant! A short, fast, focused guide delivering immediate results.” as Packt describes it and for a very affordable price if I may say so myself. With only 66 pages to read, I did find the time to read it and share my thoughts on it with you. The Citrix XenDesktop 5 Starter book, written by < target="_blank">Mahmoud Magdy offers you a quick starter on Citrix XenDesktop. The author starts by explaining Virtual Desktop Infrastructure (VDI) and the XenDesktop Architecture. This gives you a quick insight in his own struggle with a lot of terms and how they each fit into the desktop virtualization puzzle. I would have loved to see the explained terms accompanied with a visual representation as Citrix’s FlexCast model comes with a very powerful visual aid to understand the differences between techniques and required components. Without the ‘big picture’ you might need to read the text multiple times to fully comprehend the different types of desktop virtualization you can support and implement. I do like the chosen presentation to explain each XenDesktop component, clear bullet lists for each component, making it an easy sheet for future references as well. The next chapter describes the XenDesktop installation in clear steps for each component. I find it an interesting choice to include the Citrix License Server installation in the PVS section, as I personally would have given the License Server it’s own section, as it is the core component of many Citrix product implementations. But that’s just a small detail. Each installation step is explained in great detail with a very good mix of text and screenshots to building a good lab or Proof of Concept environment. Followed by further explaining the administrative tasks to set up your environment and deliver virtual desktops to your users. This book does only focus on the main VDI type that XenDesktop is used for, delivering the OS streamed virtual desktops based upon Virtual Machines (VMs). I do think, with this book the “best is saved for last” as the last chapter challenge you to think about your VDI strategy by offering you a top 5 of design considerations for XenDesktop and making you aware of some questions you can ask yourself to test if you have taken everything in consideration for your design, like Hypervisor and network limitations. And a useful list of sites, blogs and twitter accounts to follow on the latest XenDesktop news and information. I like the idea of an instant series to get a quick understanding of the topic and offer a starter (step by step instructions) for settings up your own lab. For XenDesktop in particularly it would have been nice to have the architecture and/or phylosophy explained in more detail as I personally like to understand where the product is coming from and on what foundations it is based. This chapter could have offered some more details I.M.H.O. It does offer a great starter on setting up your lab and even I do love that top 5 considerations chapter to trigger designers to keep some very important considerations (or so I believe) in mind when implementing your XenDesktop infrastructure in a production environment. This book is sufficient to get your started, but you’ll need more research and information for running and administrating XenDesktop in a production environment. I would recommend Administrators to buy the Citrix XenDesktop Cookbook as it offers more details on administrating the XenDesktop infrastructure. If you are looking for a cheap reference guide, the Citrix XenDesktop 5 Starter is worth it’s money. 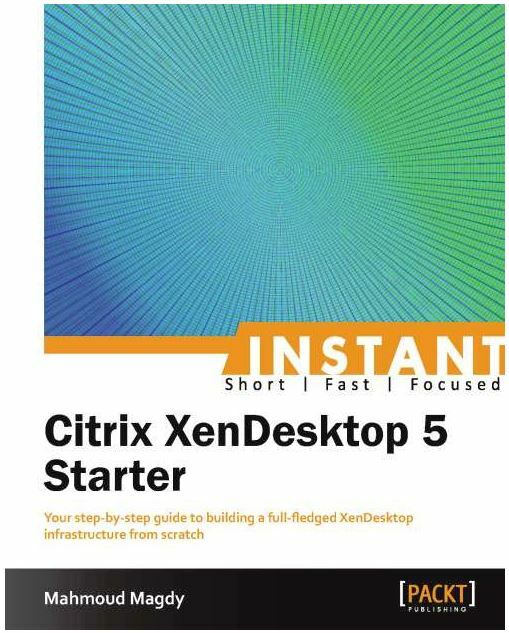 For Architects or Designers that want to get an understanding of what XenDesktop is all about and what considerations to take into account, the Citrix XenDesktop 5 Starter book is a great start that with a very affordable price!